With one-hour elapsed time feature and sweep hand. The start, stop and flyback of second and minute hands does not disturb time of day. The lever for adjusting rate is accessible without removing the clock movement from its case. Clocks contain an unbreakable, anti-magnetic cobalt alloy mainspring and an anti-magnetic temperature compensated hairspring to ensure accuracy. Mechanical clocks are stand-alone, time keeping instruments which are not affected by environmental extremes or system failure. 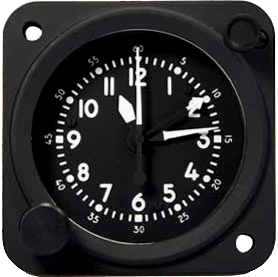 Waltham clocks can be provided with custom lighting configurations to match instrument panels and with special dials to meet specific requirements. Case: Dust and moisture-proof aluminum. Lusterless black color 37038 or Federal Standard 595. Jewels: 20-five more than required by military specifications to ensure accurate performance. All Waltham mechanical aircraft clocks are domestically produced and are certified to conform to FAR # 52.208-1. They contain jewels produced by MICROLAP Technologies Wm. Langer Jewel Bearing Plant. Clocks are furnished with standard 2 inch aircraft instrument case. Instrument panel cutout required as shown on the drawing, together with view of the mounted clock showing interference dimensions in depth. Two mounting screws and two Tinnerman nuts are available upon request. For mounting with flange behind instrument panel, screws are secured to Tinnerman nuts inserted into mounting holes in clock. For mounting with flange in front of instrument panel, screws are secured to locknuts provided in instrument panel. When locating, allow sufficient space for projections shown on drawing. To wind clock, rotate winding knob in a clockwise direction until a stop is reached. To set clock, pull winding knob out and rotate as required to set time of day hands. Knob will return to winding position when released.